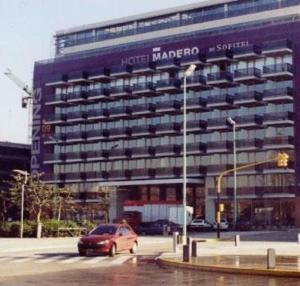 Hotel Madero By Sofitel, Buenos Aires discount hotels and accommodation. Hotel Madero by Sofitel invites you to enjoy Buenos Aires and a new hotel generation. Defining a urban and contemporary comfort style, Hotel Madero by Sofitel is located in Puerto Madero, place that summarizes the most modern architecture in the City of Buenos Aires. In a privileged location for the business man and woman, next to the financial center and easy access to the Ezeiza and Aeroparque Airport, Hotel Madero by Sofitel is next to the main tourist attractions and entertainments: floating casino, bars, cinemas, theaters, the historical center of the city, parks and the fascinating Coastal South Ecological Reserve. View photos, room descriptions and make online reservations at Hotel Madero By Sofitel. Save on room prices at Hotel Madero By Sofitel, Buenos Aires.